We love decorating for the holidays at our house. I like putting out the autumn decor, and as soon as school starts, up goes the garlands with colored leaves, and the Halloween decorations. Once Halloween is over, I swoop in with Thanksgiving knick-knacks because it’s my favorite holiday and, since I live in the United States, it’s nice to have almost an entire month to prepare once Halloween is over. But the real fun comes out for Christmas because it’s my husband’s favorite holiday to decorate for. We have a massive tree and he burdens it with so many lights and ornaments that it is something of an attraction for the neighborhood. However, by about the middle of January, I’m ready for it to come down. It’s disrupted our entire home enough, and things start to feel cluttered. Sometimes, de-cluttering can feel overwhelming. How do you even start when you have so much stuff? Focus on one area, and you’ll get it taken care of in a manageable way. I always pick one room to start with when I’m going on a de-cluttering spree. I work on that room until it’s how I like it, and then move on to another room. If it’s a large room, I focus on one area at a time. This also works when you are taking down holiday decorations. We focus on one area at a time. I’ll take all of the ornaments off the tree first, and then move on to something else once that’s done. Compartmentalizing your efforts can make it easier to handle. Avoid trying to do it all at once. It’s too easy to become discouraged with your slow progress. If you have a lot of de-cluttering to do, it’s not realistic to expect to be done in a short period of time. Give yourself permission to take a few days — or even longer. De-cluttering my office is usually a two-day affair by the time I get around to it. I don’t even try to get it done in one day. I start with my desk area, since that’s where I have to work and I work better with a clean desk area. I do that for a few hours, and then stop. I tackle the rest of it the next day. Don’t expect to work miracles. Work as long as you can on one area, or choose a small area that won’t take as long. You’ll log a small victory that can keep you motivated to accomplish more the next day. When I have light, cosmetic clutter, it’s all about the timer. This is what I do when I’m trying to straighten the house at the end of the day, or de-clutter when company is expected. I set a timer for 15 minutes and then breeze through the house, taking care of what I can as quickly as possible. I put things away, dust areas that are likely to show more (the TV and table tops), put dishes in the dishwasher, and do some light cleaning in areas that need to be spruced up. This quick de-clutter isn’t meant to be lasting or serious, but it does help clear the area so that I feel more comfortable in my home and better able to relax or work. 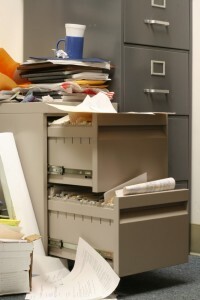 Of course, the best defense against clutter is to maintain as much as possible. We’re getting better at this at our house. We don’t buy things unless we have an actual use for them, or if we get rid of something else we don’t need. We try to have a place for everything, so if something is sitting out, we know where we can put it so that it is no longer cluttering up the house. What are your best tips for getting rid of clutter? Usually when I saw that my things are obviously a mess, especially my clothes because I’m really picky when choosing clothes. I set a day for that or even set a time to finish it. “Don’t Try to Get it Done in One Day” – This is my no-no. I want it all done as soon as possible and when I can’t get it all done within a certain period of time, I get kind of frustrated and everyone stops until I eventually get back into it! That’s where your first tip comes into play. I should just pick one area and deal with that until it’s done. I think the best tip is to just keep your home clean as you’re going through your day. Don’t just make a mess and then clean it all up at the end of the day. As you finish every activity, make sure you’ve completed what you’re doing. Good advice to work on decluttering one room at a time. We try to keep the living room and family room decluttered all the time, but the study and bedrooms can quickly become very messy. Of course, our 13 year old son is the master at cluttering up his room. I am amazed that he can actually make the room look nice and decluttered in the span of a few hours. For me, starting with smaller tasks and then taking breaks is what helps me to get it done. Even if I’m not “in the mood” to clean, just knowing that I have a small task to do, I can motivate myself to do it… and then either it slowly gets done, or I get into the cleaning mood and get a lot done more quickly! My wife and I just going through this process (again). We do it once or twice a year. We’re starting on one end of our home and moving across it. Last weekend we did our bedroom – which was the first time we’ve really deep cleaned it in far, far too long. It’s now our solace from the rest of our home that we have yet to deep clean and declutter. LOL. These tips are something I should take to heart – have been promising myself to rid our house of the clutter we’ve accumulated for a long time now. Even made some progress and then got istracted.